Hargeisa, Somaliland – It has been particularly dry this year in parts of Somaliland, the internationally unrecognised nation-state that broke away from Somalia in 1991. Small, frequent droughts have left the land and its inhabitants parched. When your livelihood depends on the generosity of the skies and they haven’t been forthcoming, every drop counts. “It’s definitely worse than last year,” said Adulahi Ismael as he watched some of his dehydrated cattle drink from a derelict public reservoir near the southern Gumburaga Banaka village. The 60-year-old who is a father to 10 children, was on a six day journey from about 75km northeast of here, in search of water and fertile land that sprouted with green rather than desolate brown. It’s the furthest he has had to travel in recent memory to find water. All of his small herd of cattle have survived this year coming off of a protracted dry season that should have ended in April. But many of his sheep, he said, weren’t so lucky. Delayed and sporadic rainy season precipitation has left areas throughout semi-arid Somaliland, particularly in the west, dehydrated – the land is barren. Historically, this nomadic lifestyle of traversing the land in rhythm with livestock – camels, goats, cattle and sheep – in search of green pastures and ample rainfall, sustained populations in harsh environments. “Here you live by the rain. There isn’t much else,” said Jeremiah Njeru, who works for the Somali Water and Land Information Management team at the UN’s Food and Agriculture Organization (FAO). The FAO tracks rainfall. Northwestern Somaliland received less than 25 percent of its normal precipitation this year, worrying numbers for Njeru. 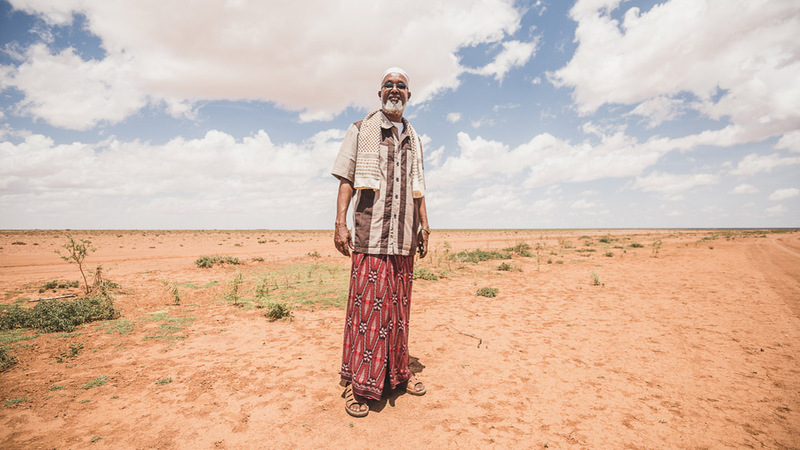 However, there is optimism that heavier rains of late June, the last month in Somaliland’s three-month long principal rainy season known locally as “Gu”, will serve as a lifeline for pastoralists until the shorter rainy season running September through October. While FAO wouldn’t scientifically consider this season a drought yet in this region, the experience for pastoral communities is often completely different. “Last year it was filled with sheep, hundreds and thousands of sheep. You wouldn’t even be able to drive a car through it,” explained Sultan Omar Mohamed. In early June it presented an austere sight – desiccated and not a single piece of livestock in a 360 degree view. “The system is so sensitive now. Even if we say it’s not a drought, the reality on the ground for people […] is that they feel it a lot,” said Njeru. He argues the “silent killer” behind water-stressed communities is the lack of environmental stewardship at both the village and government level. Unlike in the past, Njeru said, “even after rain, after the third or second day, you don’t see anything. There is no recovery”. No water is absorbed. No grass grows. Livestock and crops die. People’s livelihoods suffer, he added. Ahmed Awale, the chairman of the local environmentally focused NGO called Candlelight, like Njeru, emphasised the term “now” when discussing drought. He alluded to more recent environmental circumstances that challenge pastoralists. It is “extremely scary”, he said, that as the world grows hotter and rains more erratic that this can dictate a person’s livelihood. “Now if you have a below normal rainy season followed by one with no rain, it could be a disaster,” he told Al Jazeera. Disasters draw headlines, often when it’s too late, like the deadly drought that hit the Horn of Africa in 2011 affecting some 13 million people. In parts of Somalia, famine was declared after the drought and an inability for aid organisations to reach areas held by the militant group al-Shabab left thousands starving. But crops also need water to grow. With no financial means to truck in water, many of Hurre’s crops have also died. Hurre envies them, he said with a laugh. He knows that Hargeisa would offer his seven children greater opportunities for education, but he also understands that his skill-set wouldn’t take him far in an urban setting. “Once you leave for the city, you never come back,” he said.